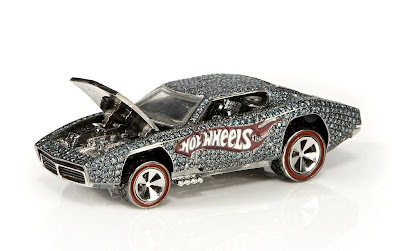 Earlier this year, the 4 billionth Hot Wheels car rolled off the line, just in time for their 40th anniversary. One thing I love about Hot Wheels is that they are still one of the best deals in town - how long has their price remained unchanged? I'm not exactly sure, but its been a long time. For just under a dollar, you can purchase one of hundreds of different cars. Well, expect to pay a little more for this one. 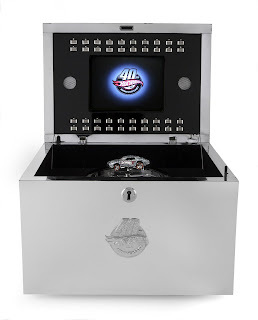 To celebrate their anniversary, Mattel has produced a one-of-a-kind masterpiece in the proper 1/64 scale, but unlike the usual Hot Wheels, this one is crafted out of 18K white and yellow gold, and carries 23 carats worth of diamonds, colored diamonds, and rubies. It even comes with a special case that is encrusted with yet even more gems. It is being auctioned off for charity this weekend at the Bohhams' California Classic Auto Memorabilia show on October 25 in Los Angeles. That's cool and all, but what they should have done is randomly insert this car in one of their blind-box Mystery Cars. Now that would have been the ultimate Treasure Hunt.